In a large saucepan bring the chicken stock to a boil. Add taco and ranch seasonings and stir until dissolved. 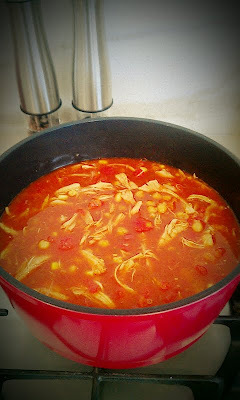 Add the chicken, corn, beans, chick peas and tomatoes, reduce heat and simmer. Add the spices and cilantro. Stir in lime juice just before serving. To serve, top with any or all of the following: broken tortilla chips, cheese, sour cream and avocado slices. Watermark theme. Theme images by hatman12. Powered by Blogger.